Six word Saturday: what’s so interesting to my dad? Three little girls pose for the camera with one little boy (my Dad) whose attention is elsewhere. I wonder what he was looking at? Photo: taken Kirkcaldy, Fife, Scotland. c. 1933. From Leslie family archive. Margaret Bisset and Alexander Black, great, great grandparents. Headstone in Dysart Cemetery, Fife, Scotland. The existence of two boys who died in infancy was an extra, and unexpected piece of information. Photo: Leslie family archive. Every family historian knows that headstones can provide a mine of new information; this one has helped me not only document lives I was aware of, but told of two more I hadn’t even suspected. 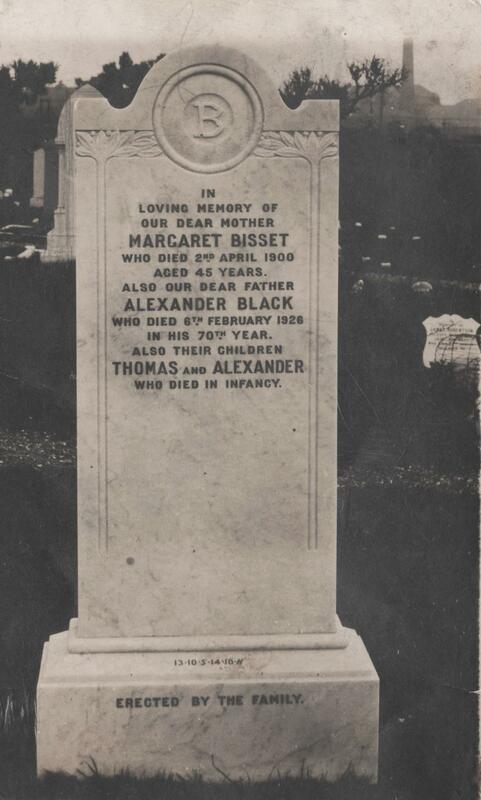 Margaret Bisset and Alexander Black were my great great grandparents. I’ve written a little about their origins in the past, but hadn’t documented their family. Their daughter Catherine was my mother’s maternal grandmother, and a presence in my early life. I’d long known from my mum that my great gran’s mother had died at a young age, but I hadn’t been able to find a record of the death. This photo, which mum gave me last year, gave me the information I needed to find Margaret Bisset’s death record. Mum was right; Margaret was only 45 when she died on April 2, 1900, leaving a husband, two adult daughters and three children under 16. The cause of death was uterine hemorrhage and heart failure. Alexander Black died on February 6th, 1926, having lived long enough to see his daughter Catherine marry and bear four of her five children. 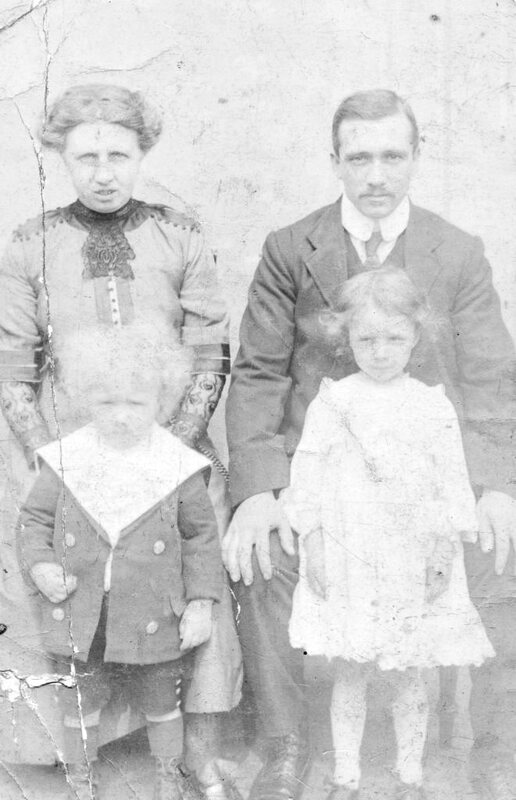 Catherine Black and her husband Alexander Cruden with their two eldest children. My grandmother, Margaret Simpson Bisset Cruden (named after her maternal grandmother) and Stewart Cruden. Photo: Leslie family archive. What was “extra” on the headstone was information about the existence of two boys — siblings to my great grandmother — who had not survived infancy. This branch of the family tree should now have two extra twigs. When I went looking for them, I realised I hadn’t really documented this family well at all. Alexander Black and Margaret Bisset were married on 7 April 1879, in Scoonie, Fife. Alexander’s occupation was listed as Labourer of (something I can’t read); his age 20 and his address Leven (Scoonie is the parish in which Leven is located). Margaret’s occupation was given as Flaxmill worker; her age 22 and address also Leven. I know from their birth records that Margaret was born on 19 April 1856 in Leven, and Alexander on 5 May 1856 in Kinglassie (which would have made him almost 23 — not 20 as on the marriage record). The 1881 census shows the family the family living at 2 Henderson Street, Leven with a year old daughter Helen. The 1891 census shows that the Blacks had moved to Dysart — about eight miles down the Fife coast. 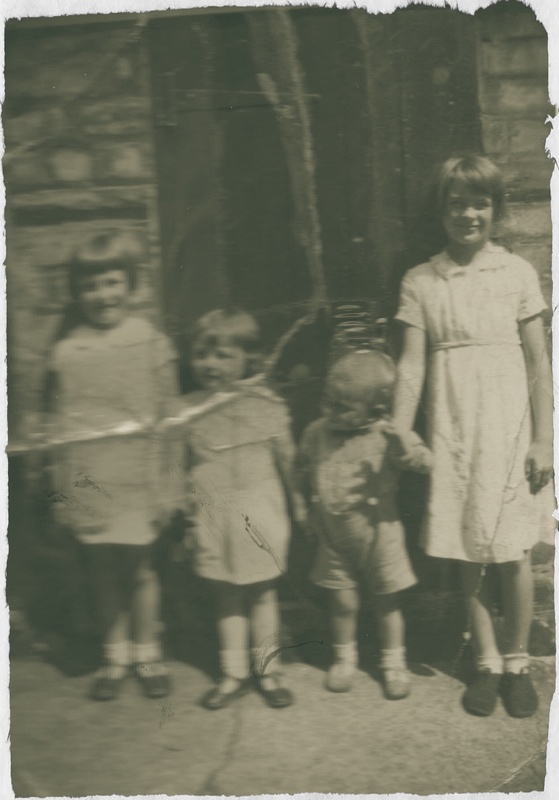 By then the family had grown to include Caroline, age 8; James, 5; Catherine, 2; and four month old Janet. Alexander’s occupation was given as coal miner. By the time of the 1901 census, Margaret had died and Alexander was living at 17 East Port, Dysart with his five children. He was still working as a coal miner. The three eldest, Helen, Caroline and James were all working. Helen is listed as a housekeeper (perhaps for the family itself), Caroline a linen weaver and James an apprentice cabinet-maker. Both Catherine and Janet (Jessie) were at school. The 1911 census shows Alexander, still working down the mines, living alone, but next door to his daughter Catherine and her husband (my great grandparents). Helen Black was born on 12 June, 1879. Margaret was obviously seven months pregnant when she married, but this seems to have been quite normal for the times. After the 1901 census, Helen was no longer living with her father. I don’t know if she married; a search of the marriage records in Scotland’s People hasn’t revealed any likely matches, but with no real detail beyond her name, this is a dead end for now. I will ask my mother if she knows anything about her great aunt. Caroline Black was born on 20 May 1882 at South Street, Leven. She married Thomas Duncan, of 21 Rosslyn Street, Gallatown on December 2nd, 1904. He was 21 and worked as an iron turner; she was 23 and a linen weaver. The 1911 census shows the Duncan family living at 12 West Sommerville Street, Burnt Island (about eight miles down the Fife coast). The couple had three daughters; Margaret, 6; Euphemia, 5; and Caroline, 1. That census was the first to record how many children a woman had borne; Caroline Black is recorded has having had six children – so obviously three had died – presumably in the “gap” between Euphemia and Caroline. The census also shows that Caroline’s brother James was living with them at the time. He was single and also working for the railway company as a carpenter. James Black was born on 26 July 1885 at South Street, Leven. He married Margaret Heigh Wilson, on 20 December 1912, in Burnt Island. His occupation is shown as journeyman joiner. I have only found a birth record for one child so far; Alison Lawson Wilson Black, born in 1915. Catherine Simpson Bisset Black was born on 5 May 1889 at South Street, Leven. She married Alexander Cruden of 17 Lockhead Crescent, Coaltown of Wemyss on 27 March 1908. He was 17 and a coal miner; she was 18 and a housekeeper. I’ve written about Catherine and Alexander — my great grandparents — elsewhere. Janet Bisset Black was born on 3 December 1890 at 75 High Street, Dysart. So far I haven’t been able to trace her in the 1911 census or find a marriage record. So where do Thomas and Alexander fit in? Given that both names are quite common, I started at FamilySearch rather than spending Scotland’s People credits trying to identify the “right” Thomas and Alexander. On the off-chance that either boy had been born before the couple married, I set the date range between 1876-1900 and the location as Fife. This search produced no children at all for Margaret and Alexander Black. I then searched Scotland’s People and to narrow down the results looked for births registered in Scoonie parish between 1879-1890; and in Dysart between 1890-1900. Thomas Bisset Black was born on 22 October 1887 at 23 South Street, Leven and died on February 25th 1888, aged four months. The death record says “probable cause of death enteritis with perforation.” This is an inflamation of the small intestine and is usually accompanied by diarrhea, dehydration and fever. Alexander Black has proved more difficult to locate. There were nineteen children of that name born in Fife between 1888-1900. While only one was in Scoonie, and one in Dysart, neither of these turned out to be “my” Alexander. Given that I know from birth and census records where the Black family was living during Margaret and Alexander’s marriage, it seems unlikely that they would have had a child born outside of either Scoonie or Dysart. Seven children (aged 0-6) called Alexander Black died in Fife between 1888-1901, but again, none of these is the right child. I’ve tried spelling variations on both names, but with no success. I did wonder – given his mother’s cause of death – if Margaret had perhaps died giving birth to this child, so I extended the date range to 1901 (on the basis that he doesn’t appear in the 1901 census), but this has proved fruitless too. I’m left wondering if Alexander was a stillbirth? These were not recorded until 1939 so I’m not going to be able to know for sure. Going back to the headstone which sparked this search, it says “died in infancy” of both boys. While it is nice to be able to document lives, the fact that these children existed and were honoured and remembered by their siblings who erected the headstone – that is enough. My great gran, Catherine Black and her sister Caroline. 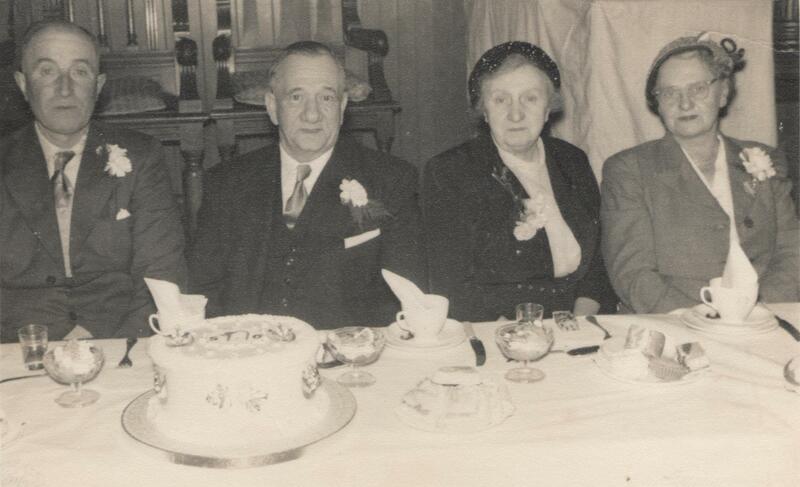 Photo taken at my great grandparents Golden Wedding anniversary. Also in the shot my great grandad, Alexander Cruden and (far left) his brother in law, James Fowler. Photo: Leslie family archive. 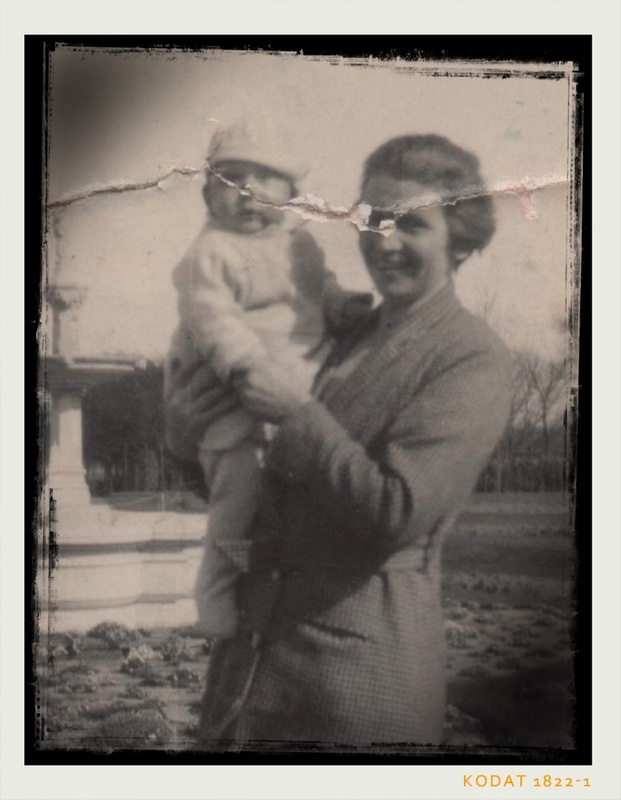 My grandmother, Susan Elder with my father as a baby. Kirkcaldy, Fife, 1933? 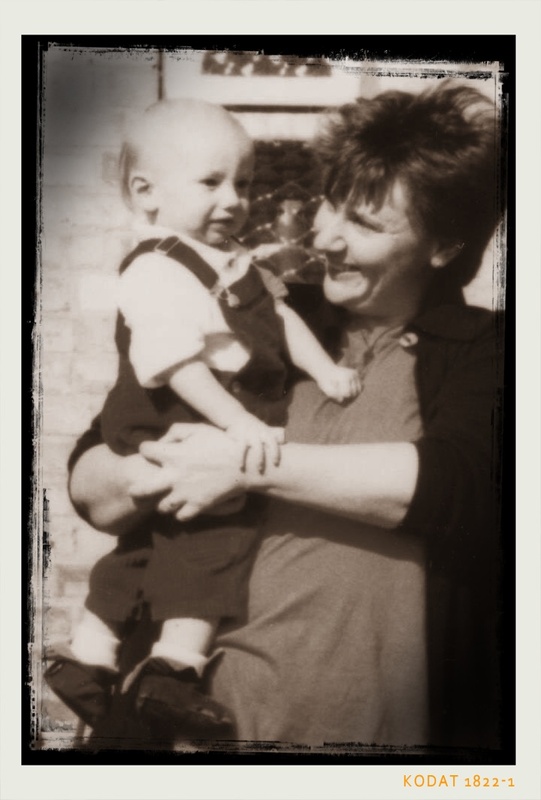 Me with the boy-child, Olney, Bucks, 1999. I guess as photography has become more common, people dress up less “for the photo.” I’m certainly looking a lot less groomed and glamorous than my gran. Ron and David Leslie. 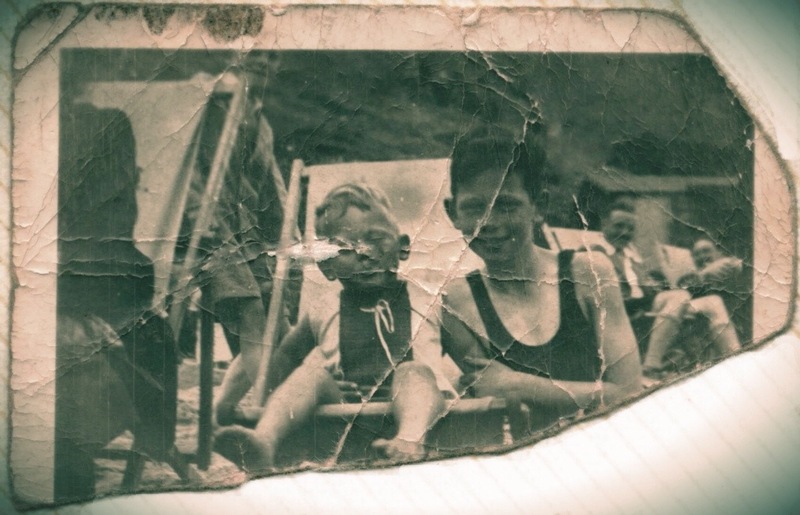 My dad and his older brother David at the seaside. I think this must have been taken around 1933. 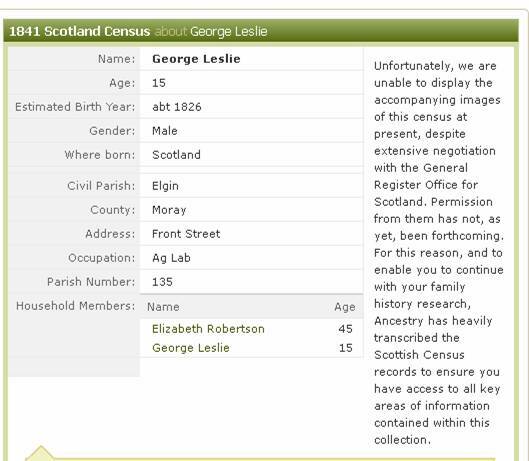 Elizabeth Robertson, my 3x great grandmother exists in the birth record of her son, George Leslie, this census record and on George’s marriage record. I thought I had found other traces of her life, but I’m now sure that was a different Elizabeth. Nowhere left to look, for now.